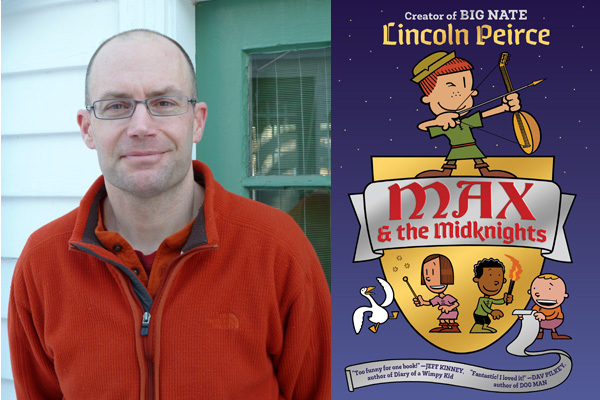 We are thrilled to host one of the most popular author/cartoonists in the industry, Lincoln Peirce, creator of Big Nate! The event will consist of a visual presentation, drawing demonstration, Q&A segment and book signing. Overflow ticket holders will view the presentation via live broadcast on the WImpy Kid Studio event space, then join the signing line to meet Lincoln in person. A copy of MAX & THE MIDKNIGHTS must be purchased at the store in order to get into the signing line. Personalization is allowed- first name only. One additional book from home may be signed. No posed photos. An Unlikely Story staff member will take photos with your phone/camera while Lincoln signs your books. Max wants to be a knight! Too bad that dream is about as likely as finding a friendly dragon. But when Max’s uncle Budrick is kidnapped by the cruel King Gastley, Max has to act…and fast! Joined by a band of brave adventurers—the Midknights—Max sets out on a thrilling quest: to save Uncle Budrick and restore the realm of Byjovia to its former high spirits! Lincoln Peirce (pronounced “purse”) is a cartoonist/writer and New York Times bestselling author of the hilarious Big Nate book series (www.bignatebooks.com), now published in twenty-seven countries worldwide.